If you have any questions or want to enquire about dates, use our form to contact Simon & Wendy Bennett or see their website for more information. Augill is a one-off, a folly castle in beautiful country. It may look grand, but it’s anything but – Simon and Wendy run their home with a rod of pure sponge. It’s wonderfully informal and children love it. There are no uniforms, no rules, you just come to kick off your shoes and relax. You can do this in various places: on sofas in front of the fire in the hall; by a grand piano in the music room; in the honesty bar that opens onto a terrace; or in the cinema in the old potting shed. Breakfast is served communally in a vast dining room under a fine, ornate ceiling – local bacon, eggs from resident hens, homemade breads and jams. Elsewhere, panelled walls, roaring fires, books, art and antiques. Colourful bedrooms are all different. Some are enormous, one has a wardrobe in the turret, you’ll find big bathrooms, bold colours and vintage luggage. Cottages are good for families and there’s lots for children to do – dressing up boxes, five acres of gardens, a treehouse and playground, too. The Dales and the Lakes are close, but sybarites may just want to stay put. You can come to get married, too. Dinner, £25-£30. Supper platters £15. Afternoon tea £18. Children’s high tea £10. Very comfortable, very family friendly, exactly as described. Extremely friendly staff, great afternoon tea, lovely breakfast everything has been thought of, from the games room to the cinema to the honestly bar, highly recommended feels like you are staying in your very own castle! Lovely stay in a quirky castle. Rooms beautifully decorated, very warm and comfortable. Relaxed, informal air and helpful staff. Loved the honesty bar and cinema. Very highly recommended. The antithesis of stuffiness. If you have ever dreamed of staying in a magical fairy tale castle, with beautiful bedrooms, fluffy pillows, roaring log fires and sumptuous sofas ... then Augill Castle will not disappoint. It is a truly magical place, with a warm welcome and a team of kind people who cannot do enough to make your stay feel special. From the minute you walk in until the moment you leave, you will be surrounded with warmth, genuine hospitality and delicious food ... The afternoon tea was amazing and the breakfast the very best we've ever had in Cumbria! A very special place. It is full of character and grandeur whilst being wonderfully relaxed and informal. I like the fact that the owners encourage you to make yourself at home in the castle, not just feel you've rented a room there. For example,there are no little drinks trays in the rooms, instead you can make yourself a good range of drinks in the north wing kitchen! I don't think we've had such a relaxing break for years. I highly recommend it. A gem of a place, where you can live a life of luxury, pretend to be rich for a while, enjoy excellent food, comfortable beds in splendid rooms and have a stay which is as peaceful as you make it. Wonderful staff with caring owners for whom nothing is too much trouble. Exceptional! We had our wedding at Augill Castle from the moment we arrived we felt relaxed, welcome and well looked after. 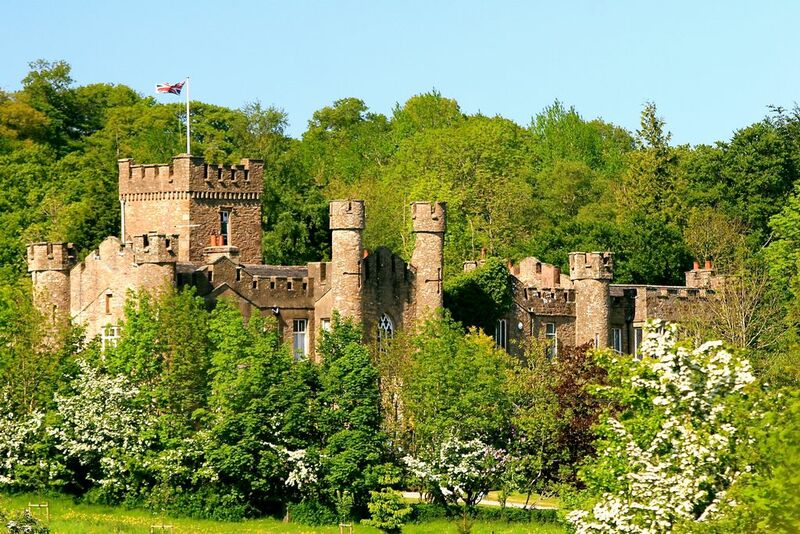 The castle is amazing with lots of charm and character, wonderful log burring fires to perfectly sumptuous sofas to lounge and amazing bedrooms. We cannot thank Wendy and Simon enough for making our wedding day so special and our guests so welcome. Every detail was perfection Wendy, Simon and not forgetting there brilliant team took care of all our wedding arrangements with such professionalism. Our guests were truly surprised and we loved every moment. A wonderful stay from start to finish. It was so good we would've stayed longer if it wasn't for the fact we had to get back home. Nestled in beautiful countryside and close to plenty to see and do, Augill Castle was just incredibly comfortable, everything we needed in a family place to stay. The kids were able to be free to play games from chess to snooker and a whole heap in-between, play tennis and in the tree-house. Their favourite escape had to be the cinema with popcorn! An incredibly warm, inviting place that offers everything you need to make you feel relaxed and at home. Incredible and magical place! We enjoyed the experience very much. Both rooms and gardens are wonderful. Kind staff always ready to help. Nice bar and playroom! Food service is excellent. Ideal to take a brake and refill batteries on a day out in the countryside. Kirkby Stephen is also a beautiful place, really nice to stop by and have a drink! A castle but with the feeling of a warm and friendly home. The family and team were marvellous, nothing was rushed or seemed too much trouble. Dinner was delicious, shared at a long table in the elegant dining room with the other guests, yet still informal and relaxed. Breakfast was sumptuous. The rooms are unique, lots of detail with many little extras and luxuries. All ages are catered for, games for children, tennis, library, 'honesty' bar, lovely grounds. We had a splendid afternoon tea with some relatives and friends and we loved the sense of 'make yourself at home', genuine hospitality. I am very sensitive person and wanted to make a special moment for my wife. When we arrive at the hotel, we were received so nicely by the staff, all started perfectly. My wife wanted to change the room - she loved the blue colour room. It was without any difficulties and we have so much appreciated a great place, a very welcoming personnel. A lovely quiet place to stay with large comfortable rooms in beautiful grounds. Friendly and helpful staff. No hesitation in recommending the hotel. Augill Castle was just what we had been trying to find and certainly not only the highlight of our trip but the jewel in the crown of all the places we stayed or visited and more than exceeded expectations. Everything in the castle puts you at ease and it even operates an honesty bar where you can go and help yourself to drinks from behind the bar and just jot down what you've had. Our sincere thanks go to the staff for all they did to make our stay so enjoyable. Had an amazing time recently at the beautiful Augill Castle - starting with a lovely greeting from Wendy who was genuinely friendly and helpful - Dinner was extremely nice and a dining revelation as we we're able to choose where we wished to dine (we opted for a table outside the bar area on a terrace that was perfect due to the weather being so warm) We have been fortunate to have been able to stay in some amazing places over the years (Augill isn't our first Castle hotel experience) but we we're so impressed that we can't wait to visit again soon.. I had a lovely relaxing stay at this fantastic hotel, It's exactly as described. As it was early season and midweek it was quiet, which suited me fine, I'm sure it's really fun at weekends when there are informal dinner parties. An amazingly elegant hidden treasure; beautiful all year round and definitely worth visiting any season. We booked our wedding in December and married in May; the castle’s beautiful is phenomenal and sits proudly in its setting no matter what the weather is doing. Wendy and her team are incredible; attentive to every need. Each and every room is individually decorated and stunning in their own right. Loved it. We definitely will be revisiting Augill time and again - once in your heart, a memory is made that will keep you going back time and again. Highly recommend it. Just a one night stay but how we wish we could have stayed longer. A very personable host, my children loved the games room and cinema room while I loved the ‘honesty bar’. Stayed in Pendragon which had loads of space for a family of four. Log fires burning added to the warmth from the hosts. Didn’t feel like a hotel but as if you were staying with a family friend who had invited other friends for you to meet over breakfast. Relaxing get away. Highly recommended 5 stars! My wife and I got married here March 2018, A thoroughly fantastic time from which the combination of the perfect setting, excellent staff and great family and friends made for the best weekend of our lives. I could go on, but not sure I could do the place justice. I can't recommend Augill enough both as a wedding destination and as a hotel, the majority of our guests are already looking to book to go back and we had children crying when they had to leave when the weekend was over! In short the whole experience was unforgettable and stunning. Thank you Augill. What a fabulous stay we had at Augill Castle! From the moment we arrived after a long Friday night drive we knew we were going to have a wonderful weekend! We had a warm welcome from Simon , Wendy and their staff and were blown away by our beautiful room and comfortable shared areas where you could kick off your shoes and sink into a lovely sofa in front of the fire. Simon and Wendy have done a wonderful job renovating the castle and we loved the shared dining area where we enjoyed beautiful breakfasts and a delicious evening meal in the company of other guests. A perfect stay! Augill Castle is in the Eden Valley, one of England's most unspoilt landscapes with one of the World's best trout rivers at its heart. Set at the foot of the North Pennines, England's last great wilderness, the castle is mid-way between the Yorkshire Dales and the Lake District, Britain's two most popular national parks. Augill Castle is unlike anywhere you have ever stayed before. We do not offer just a place to stay but a slice of genuine, quietly groovy, country house living. Everyone is welcome - we are particularly popular for multi-generation family gatherings. The Sunday Times includes us in its Ultimate 100 British Hotels as the best family hotel in the north of England. We look after the whole family with space to express yourselves and freedom to relax. In 2016 we won a Good Hotel Guide Cesar award.